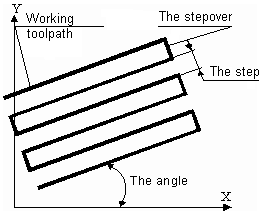 The machining step defines the distance between two neighboring work passes of the tool. Depending on the operation type the step can be assigned in vertical and/or in horizontal direction. In the roughing operations, normally, the user can assign both the vertical and the horizontal steps; in finish operations – the step for the vertical direction, in plane and drive – in the horizontal. The step value defines the height of the remaining material scallop between two neighboring passes. For more convenience, the step value can be assigned by several methods. All the above methods arrive at the same results. Upon changing the value for calculation of the real step, the system will automatically recalculate all values for definition of the same step by other methods. It allows, for example, estimating the real step value when assigning it as a percentage of the tool diameter. Irrespective of the assignment method, the real step value must be more than zero. The step in the vertical direction can be assigned in the <Parameters> page, and in the horizontal – on the <Strategy> page.